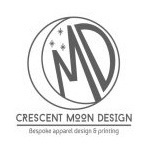 Message: PHONE: 02382147911 • EMAIL: info@crescentmoondesign.co.uk • WEBSITE: http://www.crescentmoondesign.co.uk/ • LOCATION: 74 Moresby Tower, Admirals Quay, Ocean Way Southampton Hampshire SO14 3LG United Kingdom • • Crescent moon design is a private custom clothing company based in Southampton. We deliver personalized clothing services in screen printing, embroidery, vinyl, and transfer printing. We have created custom clothing for all fields and functions, be it a whole uniform collection for a new catering company, or 10 t-shirts for a friends hen/stag do. Coordinating with individuals and companies as well means no job is too big or too small for us. If you send us an email requesting for a quote we will try to get back to you the similar day with an answer. Being proud in ourselves in offering fast turnaround times, high quality finished garments and exceptional customer support signifies you can put your trust in us to make your garments to a high standard.